Brown & Sharpe No.2 Automatic Screw Machine s/n 542-2-7179-1 5/8 w/ 6-Station Turret, 4-Cross Slides, Bar Feed. Brown & Sharpe No.2 Automatic Screw Machine s/n 542-2-5060-3/4 w/ 6-Station Turret, 3-Cross Slides, Bar Feed. Brown & Sharpe No.2 Automatic Screw Machine s/n 542-2-4967-3/4 w/ 6-Station Turret, 3-Cross Slides, Bar Feed. Brown & Sharpe No.2 Automatic Screw Machine s/n 542-2-4311-1 1/2 w/ 6-Station Turret, 4-Cross Slides, Bar Feed. Brown & Sharpe No.2 Automatic Screw Machine s/n 542-2-8106-1 5/8 w/ 6-Station Turret, 4-Cross Slides, Bar Feed. Brown & Sharpe No.2 Automatic Screw Machine s/n 542-2-7825-1 5/8 w/ 8-Station Turret, 4-Cross Slides, Bar Feed. Brown & Sharpe No.2 Automatic Screw Machine s/n 13132-1 5/8 w/ 6-Station Turret, 3-Cross Slides, Bar Feed. 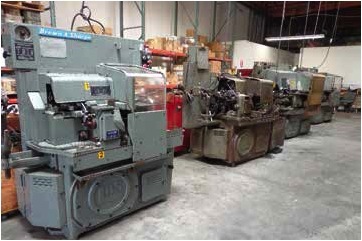 Brown & Sharpe No.00 Automatic Screw Machine s/n 542-00-6840-1/2 w/ 6-Station Turret, 2-Cross Slides, Bar Feed. Brown & Sharpe No.00 Automatic Screw Machine s/n 542-00-4355-1/2 w/ 6-Station Turret, 3-Cross Slides, Bar Feed. Brown & Sharpe No.00 Automatic Screw Machine s/n 542-00-8038-1/2 w/ 6-Station Turret, 3-Cross Slides. Brown & Sharpe No.00 Automatic Screw Machine s/n 542-00-2885-1/2 w/ 6-Station Turret, 3-Cross Slides. Hardinge DSM-59 Second OP Lathe w/ 230-3500 RPM, 6-Station Turret, Cross Slide. Hardinge HC Hand Chucker s/n 30851 w/ Threading Attachment, 8-Station Turret, Power Feeds. Rutland mdl. 26660530 Milling and Drilling Machine s/n 131377 w/ 8” x 28 ½” Table, Power Feed. Solberga Type SE1235 Geared Head Drill Press s/n 966 w/ 48-1584 RPM, 8-Speeds, Power Feeds. Universal Automatics mdl. AV Automatic Drill s/n 1768. Barker mdl. AV Bench Model Horizontal Mill s/n 301 w/ 3-Speeds. Nobles mdl. 29760.20 Chip Spinner s/n E1613 w/ 2Hp Motor. Qualair mdl. HTA80 5Hp Vertical Air Compressor s/n F33868 w/ 80 Gallon Tank. Nantong mdl. 618 6” x 18” Surface Grinder s/n 100277 w/ Magnetic Chuck. Harvel 7” x 15” Surface Grinder w/ Magnetic Chuck. (3)Burgmaster 6-Station Turret Drill Presses. Delta Pedestal Drill Press w/ Procunier Tapping Head. Intergram 12-Speed Bench Model Drill Press. (2)South Bend Bench Model Drill Presses. (3)Bench Grinders. 14” Abrasive Cutoff Saw. (2)Akerman & Gould mdl. AC-1 and AC-3 Pneumatic Hot Stampers. (2)Toledo Counting Scales. (5)Brown & Sharpe Slotting Attachments. 6” Angle-Lock Vise. 3” Angle-Lock Vise. 6” Machine Vise. No.2 Collets and Feed Fingers. No.0 Collets and Feed Fingers. No.00 Collets and Feed Fingers. 250)5C Collets. 5C Indexing Head. 5C Spin Fixture. 5C Pneumatic Collet Closers. 5C Collet Closer. Radius/Angle Dresser. rills, Taps, Reamers, High Speed and Carbide Tooling. Tooling Cabinets. Pipan Arbor Press. Pacific Gage 12” Optical Comparator. (5)Gage Pin Sets. Forklift : Clark CGC25 4600 Lb Cap LPG Forklift s/n C365L-0032-9467FB w/ 180” Lift Height, Side-Shift.